This jaunty creature embodies most of the positive traits of the signs it combines. Scorpio Horses are magnetic. And they are popular. They are disciplined and accomplished. They are persuasive and inspired, dedicated and fashionable. Scorpios born in Horse years are both independent and autonomous. There is little to prevent these folks from succeeding in a world class way. This character has the vision and perspicacity of Scorpio and knows how to couple it with the Horse’s natural vitality. She will take on projects that would cow anyone less competent, and carry them to their logical ends with remarkable facility. The Scorpio Horse is a doer of impossible deeds. Success is written all over whatever she touches. She’s not afraid of work and she’s got some of the most unbelievably fanciful notions you ever heard of. This bent for fantasy can sometimes be their undoing. The Scorpio born Horse does not fit in well with their peers. They are popular and admired, but people don’t understand them very well. They're too different. They're too odd to make others feel completely comfortable about them. Scorpio Horse is, moreover, unafraid of popular opinion and carries on with their fancy ideas no matter what or who tries to get in their way. She’s not cruel. Just ruthlessly determined to get where she is going. The Scorpio Horse has a rather difficult time getting started in life. She is easily affected by her surroundings, and if her family life is not perfectly peaceful, she can suffer undue guilt feelings. She’s an anxious sort, and so sensitive to what is going on around her that she feels responsible and may retreat into his shell as a child. As a young adult she will search hard to find her true path. Once she gets past thirty, nothing can stop her. She’s a winner, an eccentric, and quite a deep thinker as well. Scorpio/Horses likes to dress up in fanciful garb. They are drawn to the conservative but find adding a rhinestone clip or splashy tie irresistible. She likes to present well and is overly concerned about physical attributes, both in herself and others. She worries if she notices a wrinkle. He cares if he’s going bald. This person will have excellent skill with things manual. He or she may build rooms or restore old houses or design wallpapers or knit shawls with weird patterns in them. Scorpio Horse is, in fact, a bit of a bohemian by nature, and does not hesitate to flout convention or commit acts that “shock” society. Scorpio/Horses are compassionate and will help out those less fortunate than themselves. They are not comfortable with money. They are, by turns, stupidly spendthrift and stingy. entertained and amused. The Scorpio Horse likes sports and enjoys games. You will love him or her best by standing by in times of crisis and otherwise staying out of his or her way. The Scorpio Horse needs a helpmate in the truest sense. He would like to do it all himself and certainly could—but she’d rather have a nice sidekick. If you meet up with a tawny Tiger or graceful Goat, you’ll probably fall for the Cancer, Virgo, Capricorn or Pisces variety. The Virgo and Pisces/Dogs, despite their apparent disquietude, appeal to your sense of caring. Rats never get on with Horses. Be particularly wary of Taurus, Gemini, Leo and Aquarius/Horses, especially when it comes to matters of the home. Aquarius/Cat is the last person on Earth you should hang around with. Scorpio/Horse is meticulous about her interior. She wants it just right and comfortable as well as beautiful. She likes things orderly but is not maniacal about cleanliness. Mostly, Scorpio/Horse is conscientious about her surroundings, and if they are pleasant it is because she made them that way. As a parent, this person can be accused of fanaticism. Scorpio/Horses adore their kids. They live for their offspring and they do far too much for them. They give their kids everything any kid could want, and more. They spend time with them and they play with them. Scorpio/Horses should have scads of children. They are really good at it. These children are cuddly and wise, sensitive and sensible. If a parent says “You can’t have that today, dear,” the Scorpio/Horse child, reasonable beyond his years, will invariably say, “All right. I can always have it another time.” These kids are loving and easy to raise. They go it alone for most of their lives, and ask little more than love and feeding. They spend much time on their own, and like to be allowed to do crafts and pursue hobbies. Gifted for achievement, the Scorpio born Horse mutely proclaims from the moment she is born, “I demand to create.” It is a motto that suits her down to the ground. She will carry off all professions with aplomb but will be best suited to artistic ones. As an employee, the Scorpio/Horse may prove unruly. She hates routine. She can adjust to workday habits, but she prefers to do things on her own time and in her own personal way. 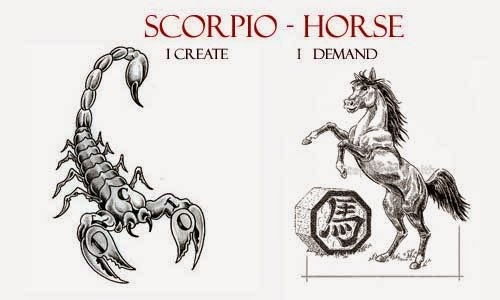 I see the Scorpio/Horse best suited for leadership or even for independent solitary work. She is always champing at the bit to get his project done. She needs little prodding. There is no reason Scorpios born in Horse years cannot be bosses. But I expect they would have difficulty delegating authority and might tend to do rather too much of the work themselves. Suitable careers for this character are: undercover agent, lawyer, medical researcher, entrepreneur, chef, choreographer, singer, city planner, graphic artist, film producer, actor.